The U.S. loses about 60,000 corporations per year and has lost about 1 million corporations since the Tax Reform Act of 1986. Over time, more businesses have structured themselves as "pass-through" entities. This allows profits to be passed through to owners and taxed at individual tax rates that are often lower than the corporate tax rate and eliminates double taxation for shareholders. More than 60 percent of U.S. business profits are now taxed under the individual income tax code rather than the corporate tax code, which explains why the U.S. collects a relatively small amount of tax revenue from corporations despite having the developed world’s highest corporate tax rate. Outside of taxation, the traditional corporate form often provides the most efficient business structure for large-scale projects and investments. Excessive corporate taxation and the subsequent decline of the corporate sector artificially limits this important aspect of the economy. The U.S. should do what the rest of the developed world has done: reduce the corporate tax rate, integrate the corporate and shareholder taxes to avoid double taxation, and limit corporate taxation to profits earned domestically. Corporate inversions have been the dominant tax issue over the last year and have forced a serious evaluation of the U.S. corporate tax system. While there is widespread agreement that the U.S. corporate tax code is out of step with our global competitors, there is also concern that inversions and other aggressive tax planning techniques are eroding the nation’s tax base. Indeed, the Treasury has issued a series of rules intended to reduce the financial benefits from inversions. What has been missing from this debate, however, is recognition that inversions are just the latest example of a more than two decade long trend in self-help tax reform by American businesses. The number of traditional C corporations in the U.S. has fallen to a historically low level, which has, unsurprisingly, eroded the corporate tax base. There is now more net business income taxed under the individual income tax system than the traditional corporate tax code, a trend that does not appear to be stopping any time soon. The main driver of this trend is the country’s poorly structured tax code, specifically its two layers of tax on C corporations (the corporate tax plus capital gains and dividends taxes on shareholders). In contrast, businesses that file under the individual tax code, such as partnerships and S corporations, experience just one layer of tax, because they pass the profits through to owners who report them on their individual tax returns. Unfortunately, the status quo is troubling for the long-term health of the economy. C corporations usually provide the most efficient business structure for large-scale projects and investments. However, high corporate tax rates drive activity away from the corporate sector, artificially limiting this important aspect of the economy and harming productivity and workers’ wages. Thus, the recent transition away from C corporations to other types of business structures leaves potential growth and economic activity on the table. That so many millions of businesses have nonetheless chosen to be pass-through entities points out the need for fundamental tax reform that lowers the corporate tax burden and, ideally, treats all businesses alike. Corporate inversions, of which there were only fourteen in 2014, can explain only a tiny number of these losses. As Figure 1 shows, the decline of the traditional corporate sector has generally coincided with the rise of the pass-through sector, comprised of businesses such as partnerships and S corporations that pass profits to owners who report them on their individual tax returns. Pass-through businesses are subject to just one layer of tax, the individual income tax, while C corporations face double taxation due to the corporate tax and shareholder taxes on dividends and capital gains. Pass-through businesses have grown dramatically since 1986 such that more than 90 percent of U.S. businesses are now pass-through entities. The Tax Reform Act of 1986 reduced the statutory corporate tax rate and reduced the individual tax rate further, but ultimately raised taxes on corporations in other ways. Additionally, the Act changed S corporation and partnership rules to make them more attractive (e.g., the shareholder limit on S corporations was raised from 35 to 100). However, it appears the Tax Reform Act of 1986 was the decisive factor that marked the start of the decline of U.S. C corporations and the beginning of a long upward trend for pass-through businesses. S corporations grew from about 800,000 in 1986 to 4.2 million in 2011, and partnerships grew from 1.7 million to 3.3 million. Sole proprietorships—by far the most numerous pass-through business with about 23 million in 2011—are not shown in the graph, because they function in a way least comparable to C corporations. Also not shown are real estate investment trusts (REITs), which have recently become a popular way for C corporations to remove assets from the corporate tax code. REITs were originally intended for real estate projects, such as shopping malls, but they are now used by a variety of industries, including hotels, casinos, and hospitals, to limit double taxation. Early last year, the phone company Windstream got permission to spin off its fiber optics and copper networks as a REIT. While REITs are growing rapidly, thus far there are fewer than 20,000 of these pass-through business. The recession and subsequent slow recovery have led to slow overall growth in the business sector. As a result, the growth rate of pass-through entities has tapered off in recent years (see Figure 1). Since 2006, S corporations have grown at a rate of about 1 percent a year, down from a rate of about 8 percent in the 20 years prior. Likewise, partnerships have grown at a rate of about 2 percent a year since 2006, down from a rate of about 3 percent in the 20 years prior. A similar slowdown has occurred with sole proprietors. The data is not in yet, but the 2013 tax increases fall heavily on pass-through businesses, so their growth rate may have slowed even further. Combined with the decline of the traditional corporate sector, total business returns have grown at a rate of about 1 percent a year since 2006, down from a rate of about 3 percent in the twenty years prior. This is a relatively anemic rate of business growth compared to other developed countries such as the UK, where traditional C corporations, a much larger fraction of all businesses, grow at a rate of about 8 percent a year. Not only has the total number of traditional corporations declined, so has the total of their profits. 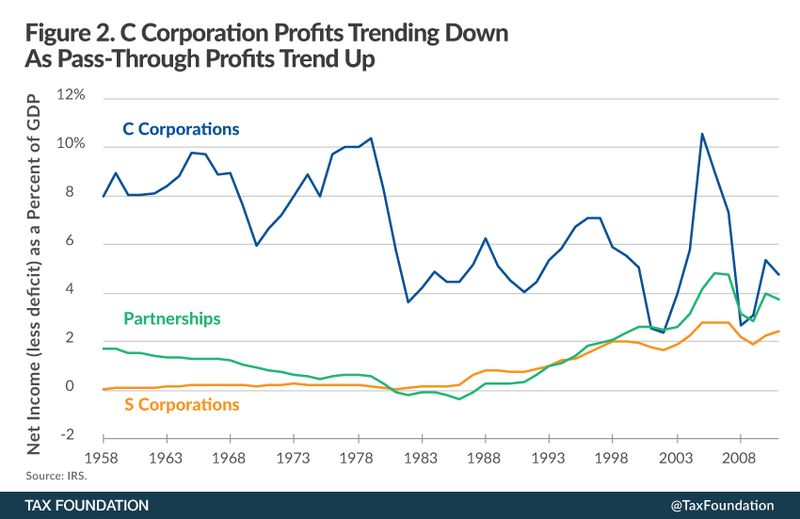 Figure 2 shows that C corporation profits, while extremely volatile, have generally trended downward as a share of GDP in recent decades, while the profits of S corporations and partnerships have trended upwards. In the 1960s and 1970s, C corporation profits were about 8 percent of GDP, while partnership profits were about 1 percent and S corporation profits were virtually nil. 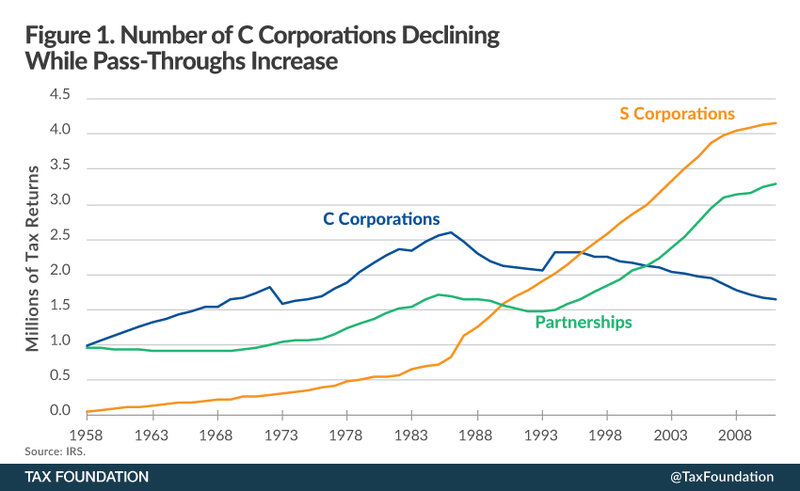 C corporation profits now hover around 4 percent of GDP (4.7 percent in 2011), while partnership profits are almost at the same level (3.7 percent in 2011), and S corporation profits are not far behind (2.4 percent in 2011). In other words, traditional C corporation profits have dropped in half since the 1970s. This trend has been obscured by the growth of pass-through profits. Many commentators claim that “corporate profits are at an all-time high,” but they are referring to Bureau of Economic Analysis data that combines C corporations and pass-through businesses, whether they know it or not. As of 2011, more than 60 percent of net U.S. business profits are attributable to pass-through businesses of all types, a ratio that generally increases every year. As traditional C corporation profits have dropped, so has corporate tax revenue, roughly in proportion: from about 4 percent of GDP in the 1960s to about 2 percent today. Many commentators ignore this fact and instead blame the decline of corporate tax revenue on “loopholes,” even though the government’s official estimate of corporate tax expenditures has shrunk over the last 30 years. Further, a substantial portion of the decline in corporate tax revenue is offset by increased individual tax revenue from pass-through businesses. Inversions have been a common topic in the news over the past few months, with some expressing concern that inversions will erode the tax base. However, the extent to which inversions actually reduce the domestic corporate tax base is questionable. In fact, corporate inversions offer a kind of self-help territorial tax reform with the potential to increase the domestic tax base. This is because inversions essentially provide inverted corporations territorial tax treatment, in which each country taxes them only on income they earn within the country’s borders. This enables inverted corporations to invest in the U.S. more easily. Inasmuch as the inversion facilitates expansion of U.S. domestic operations, inversions increase the U.S. domestic corporate tax base and thus increase tax revenue. This additional tax revenue could well exceed the loss from taxing foreign operations. At the end of the day, though, inversions are a symptom of a poor corporate tax system. Instead of shutting down the possibility of inversions, Treasury and Congress should focus on tax reform that would move to a territorial tax system and lower the corporate tax rate. The U.S. now struggles with corporate tax inversions, but this is only one of many ominous signs of a long-term decline in the U.S. corporate sector. The U.S. loses about 60,000 corporations per year and has lost about 1 million corporations since the Tax Reform Act of 1986. Many have gone to the pass-through business sector, where profits are passed through to owners and taxed at individual tax rates that are often lower than the corporate tax rate and where there is no additional double-taxation for shareholders. As a result, more than 60 percent of U.S. business profits are now taxed under the individual income tax code rather than the corporate tax code. This explains why the U.S. collects a relatively small amount of tax revenue from corporations despite having the developed world’s highest corporate tax rate. The more popular explanation, which blames low corporate tax revenue on vaguely defined corporate “loopholes,” does not withstand scrutiny. Besides, much of the lost corporate tax revenue is offset by increased individual income tax revenue from pass-through businesses. While this kind of self-help tax reform is beneficial to the overall economy because it lowers the tax burden on business investment, something is nevertheless lost. Pass-through businesses do not offer the same ability to invite investment from thousands of shareholders or easily transfer shares. That means the decline of the traditional corporate sector represents an economic distortion that is hobbling American industrial capacity and job growth. No other developed country has such a distorted business sector. Corporate inversions also represent a kind of self-help tax reform, in that they effectively achieve territorial taxation for the U.S. multinational corporations involved. This probably benefits the American economy, because these companies are now freer to invest and hire in the U.S. In that sense, the recent Treasury rules aimed at shutting down inversions are counterproductive. The solution for lawmakers is twofold. First, to grow the traditional corporate sector, reduce corporate taxes, and integrate the corporate and shareholder taxes to avoid double taxation, much as the rest of the developed world has already done. This would provide the same treatment across business types, i.e., a single layer of tax. Second, to reduce inversions and other exit strategies for U.S. multinational corporations, implement a territorial tax system like that found in most developed countries. U.S. Department of the Treasury, Fact Sheet: Treasury Actions to Rein in Corporate Tax Inversions (Sept. 22, 2014), http://www.treasury.gov/press-center/press-releases/Pages/jl2645.aspx. Arash Massoudi, David Crow, & Barney Jopson, AbbVie Reconsiders $54bn Shire Deal, Financial Times, Oct. 15, 2014, http://www.ft.com/intl/cms/s/0/8213525c-53ff-11e4-8285-00144feab7de.html?siteedition=intl#axzz3G91LB2EA. Kyle Pomerleau, Individual Tax Rates Impact Business Activity Due to High Number of Pass-throughs, Tax Foundation Fiscal Fact No. 394 (Sept. 3, 2013), https://taxfoundation.org/article/individual-tax-rates-impact-business-activity-due-high-number-pass-throughs. Bernie Becker & Megan R. Wilson, Tax Friendly Trusts Swell Under New Rules, The Hill, Sept. 10, 2014, http://thehill.com/policy/finance/217213-tax-friendly-trusts-swell-under-new-obama-rules#ixzz3CvRWpmVu. That number includes regulated investment companies (RICs), according to the IRS. See United Kingdom Department for Business, Innovation & Skills, Business Population Estimates for the UK and Regions 2013 (Oct. 23, 2013), https://www.gov.uk/government/statistics/business-population-estimates-2013. See also William McBride, Tax Reform in the UK Reversed the Tide of Corporate Tax Inversions, Tax Foundation Fiscal Fact No. 442 (Oct. 14, 2014), https://taxfoundation.org/article/tax-reform-uk-reversed-tide-corporate-tax-inversions. The measure of profits here is net income (less deficit) according to the IRS. A similar pattern is evident when looking at receipts: C corporation receipts peaked at 214 percent of GDP in 1980 and fell steadily thereafter to 139 percent of GDP in 2011. William McBride, EPI Perpetuates Myth of Low Corporate Taxes, Tax Foundation Tax Policy Blog, Oct. 9, 2014, https://taxfoundation.org/blog/epi-perpetuates-myth-low-corporate-taxes. William McBride, A Brief History of Tax Expenditures, Tax Foundation Fiscal Fact No. 391 (Aug. 22, 2013), https://taxfoundation.org/article/brief-history-tax-expenditures. It’s difficult to determine precisely how much tax pass-through businesses pay, since their profits are mixed with other sources of personal income and taxed at progressive tax rates. Kyle Pomerleau, How Much Will Corporate Tax Inversions Cost the U.S. Treasury?, Tax Foundation Tax Policy Blog, Aug. 14, 2014, https://taxfoundation.org/blog/how-much-will-corporate-tax-inversions-cost-us-treasury. Roughly 10 percent of total corporate tax revenue comes from taxing foreign profits.